OPTC Guideblog: Clash!! Vice-Admiral Garp!! Announced!! Today, the One Piece Treasure Cruise (Global) Twitter announced Garp for Global. This would likely mean that Garp is closer than everybody thinks. How soon? We can't exactly say. In either case, this announcement is big as it may mean that Mihawk will not be returning as soon as everybody thought. 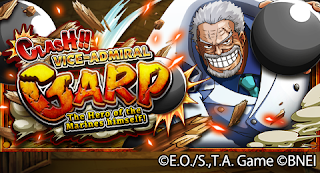 A Garp Preparation Guide will be up soon!